Paneer fried rice is a delicious variation of a veg fried rice, mainly it is a Indian meal with a chinese twist. 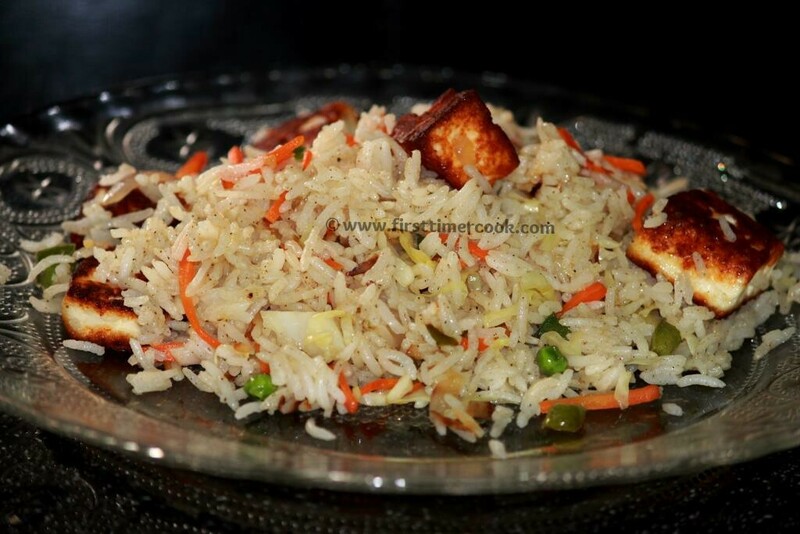 This fried rice is made with basmati rice, soft paneer and assorted vegetables. So easy to make and infact if leftover rice is there, then the recipe is easy and quick to make. Detailed process is given below step by step. Capsicum (chopped finely) 1/2 no. The main key is to cook the rice perfectly into separate grains. Rinse rice very well in water, then soak in water for 30 minutes. After 30 minutes drain the rice & put in a pressure cooker along with salt, 1 & 3/4 cup of water, ½ tsp oil. Stir and pressure cook the rice for 2 whistles. When the pressure settles down completely, remove the lid and fluff the rice. Take the rice in a plate and allow the grains to cool completely before adding to the stir fried veggies. Meanwhile grate / shred the carrot & cabbage, finely chop capsicum, spring onion, green chili. Soak the paneer cubes in hot water. In a pan add oil and saute the paneer cubes till golden brown. Keep it aside. In the same pan add the finely chopped white part of spring onions and saute till they turn translucent. Then add ginger garlic paste and saute till the raw aroma of ginger-garlic goes away. Add finely chopped green chili, sugar. Saute a bit. Add the veggies & mix well. Cook the veggies on high flame for 2 minutes. Let it be crunchy. Add salt & then the paneer cubes. Mix well. Add the cooked rice and mix gently. Add pepper powder & mix gently without breaking the rice. Add the spring onion greens lastly & serve ! ​Always ensure that the rice is cooked in separate grains. Adding veggies is totally depend upon choice. Scrambled paneer can be added to the fried rice instead of paneer cubes. Sauces like chili and soy can be added before adding salt. Add 1 tsp each.